As the holiday season winds into New Year’s Eve, I know more of you are thinking of starting diets than starting a batch of cookies, but I have a few new recipes from the holidays that are too good not to share! This first one was inspired by two lovely food gifts from the year – a large jar of demerara sugar packed with vanilla beans, making a wonderfully fragrant raw vanilla sugar, and several jars of homemade jams from my auntie. 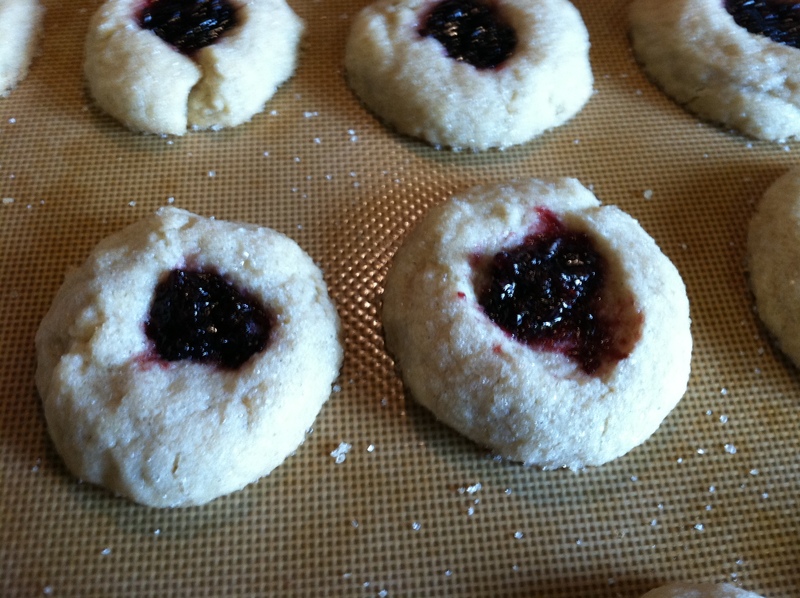 I knew I wanted to use the jam to make Jam Thumbprint cookies, a childhood favorite, but I needed just the right cookie recipe. After a few false starts, I came up with this dough that has the perfect crisp outside-soft inside texture and adds a fragrant vanilla creaminess as a counterpoint to the sweet-tart jam. Fast, easy, and really delicious, this one is a cookie all-star! See those little flecks of vanilla cookie goodness? * You can use plain raw sugar here, or make your own vanilla sugar by placing 1-2 vanilla beans into a jar or Tupperware with a few cups of sugar for 2 weeks (works with regular or raw sugar). This is a great way to store your unused pods, as it prevents the pods from drying, keeping them soft and pliable. Used pods (ones that you’ve already scraped the beans out of) also work just fine to give the sugar a lovely flavor. Cream butter and sugar until combined. Add egg yolks and mix until combined. Add the vanilla beans, a healthy pinch of salt, and flour and mix until just combined, then add vanilla and bourbon/ram and mix until combined. Let the dough rest in the fridge for at least 15 minutes. Scoop out heaping teaspoons of dough, then roll them into balls between your hands. Toss the formed balls in a bit of sugar to coat, then place, well-spaced, on a greased or sil-pat lined cookie sheet. Flatten each cookie slightly, then create a well in the center. I use a tiny v-shaped cone for this, but you can just use a small, rounded scoop or your thumb (hence the name) to create the well. This should go about ¾ of the way into your cookie – deep enough to hold a good amount of jam, but not so deep that you can see the pan underneath the dough. If the cookie cracks as you make the well (and it will), simply press the sides gently back together until the cookie regains its shape. 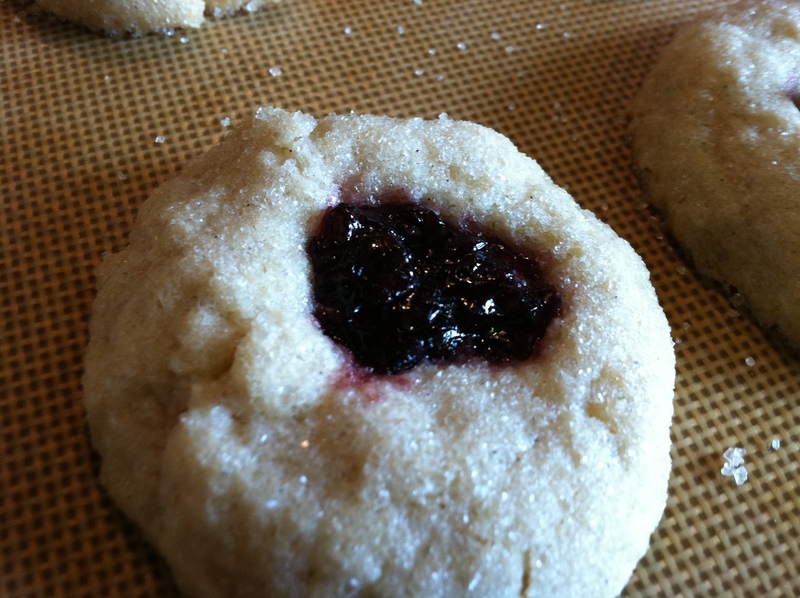 Fill each cookie with jam to just below the edge of the well. I prefer something tart that compliments the vanilla, like a tart blackberry or strawberry, but something earthy like fig jam would also be wonderful. Once filled, bake cookies for 12-14 minutes, until just golden on the bottom. Remove from the oven and keep on the cookie sheet for 3 to 4 minutes. Remove from the pan with a spatula and allow to cool on a rack. These great cookies will keep for at least a week in an air-tight container (if you can manage to keep them around that long!). 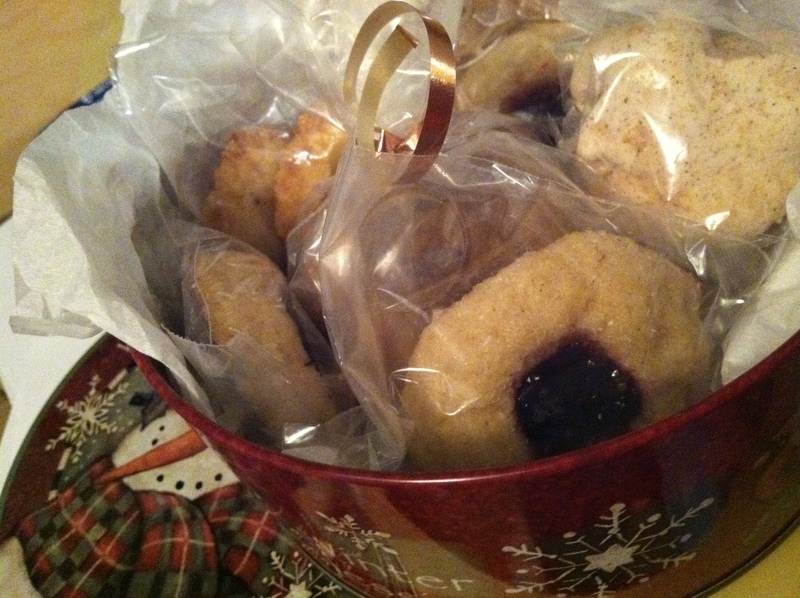 They are also great to pack up for cookie exchanges or mailed cookies.